“Winter is coming.” –it may be a catchphrase of a popular TV show, but we all know it could be the motto of Edmonton and the surrounding area. Many fill their summers with activity in fear of the winter, while others are only just gearing up when the snow starts to fall. Whatever your personality, it is imperative for the well-being of you, your passengers and your vehicle that all drivers are prepared for the reality of winter driving. Consult Park Muffler’s guide below for a summary of helpful preparations to make before the cold weather hits. While some may doubt it, winter tires really do make a difference when it comes to your vehicle’s safety and performance in inclement weather. 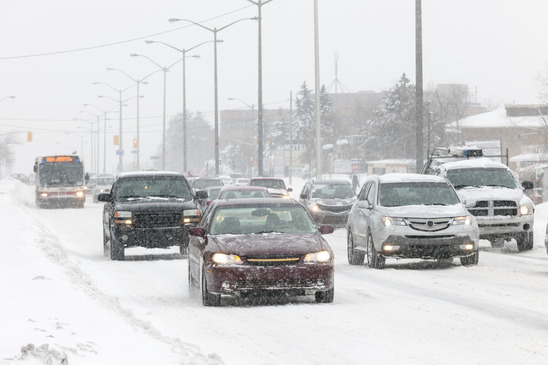 Even without snow or ice, winter tires are designed to help at 7 degrees Celsius and below. Improved traction can help prevent collisions, making winter tires a must-buy in the Edmonton area. Refer to Park Muffler’s article on winter tires for a full exploration of this topic. Get in the habit of bringing your vehicle in for inspection and service in the fall and spring. Not only will it be better prepared for winter, but any issues that come up during the colder months can be addressed before the summer. Things like fluid types and tire inflation can add years to a vehicle’s life. Prepare an emergency kit, but don’t simply rely on the one you use during the summer. Cold weather, ice, snow and more darkness calls for a different inventory than other times of the year. Add a warm blanket, warm clothes and accessories, extra water and snacks, extra flashlight and batteries, small snow shovel, jumper cables, extra flares, extra set of wipers, extra washer fluid and a traction enhancer such as sand, salt or kitty litter. The above facts are only a brief introduction to the complexities of winter driving and how to limit risk and danger. Consider a seasonal driving course and bring any questions and concerns about winter prep to the experts here at Park Muffler!